1) Got into a cat fight on my ANKLE! Ouch! Paprika was hanging out on my foot, only to be attacked by Peaches who decided she wanted that exact spot. A scuffle on TOP of me ensued. 2) They BROKE INTO MY CUPBOARD.They STOLE & ATE their probiotic envelope Forti-Flora. Yes, they ATE the envelope! Peaches threw it up later. I knew they loved it but not that much. Will hide it better next time. There's more: like the hell-bent all over the house crazy chasings like Halloween maniacs but I'll stop here. I just wanted to REPORT THEM as BAAAAAD cats! Shape up, Girls! Play nice! No more cupboard thefts! They truly did live up to their "RED DEVIL" graphic this week. YIKES!! Ellie and Allie will sometimes have a fight on Mom's tummy early in the morning. NOT a good thing!! We want to thank you again for the fabulous slideshow! It was pawsome! Well, what did your mum expect if she dressed you up as little devils? My cats also LOVE that Forti-Flora! They go crazy--I bet I can get them to eat anything --even an old shoe!--if I put Forti-Flora on it! Those costumes were appropriate, weren't they? I suppose they used that old excuse "the devil made us do it" ???!!! But they look so innocent! I am glad to learn others have had this experience...the nerve! haha....scary? I guess!! Funny too...my friends look like they'd eat me for dessert and come back for seconds. Thank you for all your work....we loved it. Sorry, but the kitties at our house have to say, "Way to go girls!" XOCK, Lily Olivia, Mauricio, Misty May, Giulietta, Fiona, Astrid, Lisbeth and Calista Jo p.s. 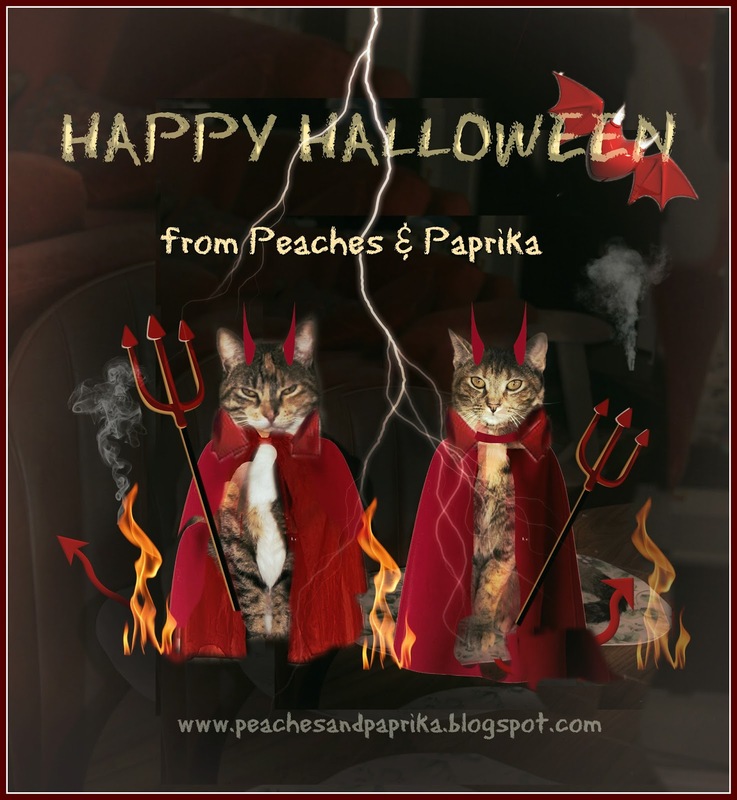 The costumes are meowvolous and spooky!